First edition first print hardback of A hunter's joyful reunion with the woods and rivers of his home country published by Algonquin Books of Chapel Hill in 1988. 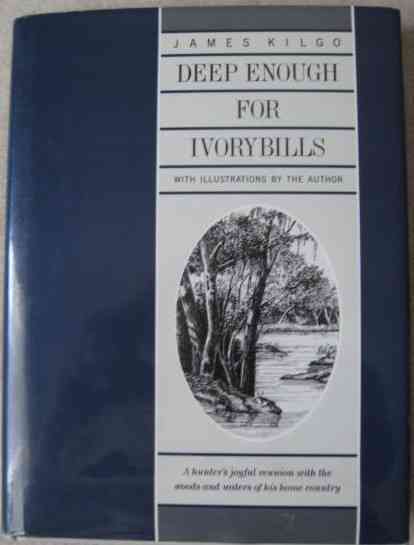 First edition first print hardback of DEEP ENOUGH FOR IVORYBILLS (A hunter's joyful reunion with the woods and rivers of his home country) written and illustrated by James Kilgo and published by Algonquin Books of Chapel Hill in 1988. The book is in near fine condition (off-white cloth boards with black lettering to spine) with no significant wear. The book is in a very good clipped dust jacket which has light creasing to the edges and slight moisture staining inside. Internally the pages are clean and tight and there are no tears or inscriptions. This is the account of a man's initiation into the outdoors heritage of his home territory. Jim Kilgo was born and raised not too far from the bottomlands of the Great Pee Dee River in South Carolina, but it was not until he was grown that he began to respond to the powerful lure of the forests, fields, and swamps of the South and the wildlife that inhabit them.